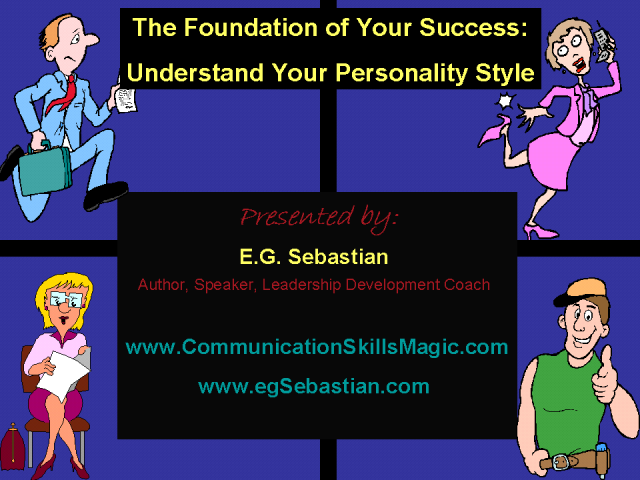 Join this webcast and discover your personality style! Discover your strength, limitations, and how to take control of some of your limitations. Our personality styles affect every aspect of our lifes: our communication style, our prouctivity, how we deal with conflict, how we socialize.. even our confidence levels... and much more. The good news is that while our personalities are set in stone, we can modify our behaviors to become more effective in every area of our lives. How would it impact your life, at this very moment, if you could significantly improve your relationships with your coworkers, managers and/or subordinates, clients, parents, spouse, child(ren), and other significant people in your life? What if there was a simple, easy-to-understand system that could help you better understand your behavior and the behavior of those around you, and as a result improve your personal and/or professional relationships? Would it be worth the effort to give that system a try? What if this "system" could also help you become more productive, and even help you understand how to motivate others to being more productive...? If you are a manager, solo professional [all sales professionals, coach, consultant, etc], parent, spouse - or anyone for whom communicating effectively is key, then this channel is for you. Enjoy it and please send us your feedback.